Berkeley Police make numerous arrests at protests. Twenty people were arrested Saturday for their roles in violence in the area of Civic Center Park, and more arrests will be pursued as Berkeley Police review social media and video footage. The charges include arrests for assault with a deadly weapon and several other felony assaults. Among Saturday’s arrests were two warrant arrests, based on follow-on investigations arising from the March 4 violence. As video and photos are reviewed for suspected crimes, the department will actively work with the public to identify more suspects. After Berkeley Police released photos of suspects involved in March 4 violence, members of the public identified suspects within minutes. Eleven people were injured and treated by paramedics from the Berkeley Fire Department. Those individuals included seven who were taken to local hospitals. The Berkeley police investigation into crimes committed during these demonstrations continues. At this time, there appear to be no reports of damage to downtown businesses and no injuries to anyone not involved with the event. Berkeley Police and the City as a whole worked to protect people’s right to free speech and simultaneously keep people safe. These goals were set even though organizers did not seek nor obtain a permit, but still widely advertised the gathering. To help achieve those goals, the City imposed a one-day rule for Civic Center Park to prohibit anything that could be used as a weapon. The City also imposed restrictions on entry and exit from the park and made people subject to citation or arrest for violating the rules. 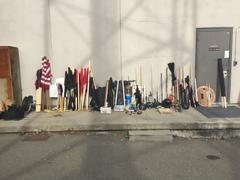 The strategy helped police to confiscate dozens of weapons, including a slew of sticks, wooden dowels and poles. 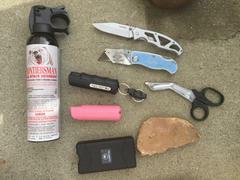 Confiscated items included a stun gun, mace, knives, bear spray, an axe handle, pepper spray and a can filled with concrete. The park had been additionally been thoroughly cleaned by City staff prior to the event, during which a realistic-appearing replica gun was found. The City encouraged people to stay safe by separating themselves from people committing violence. That is an important strategy for members of the public to use to keep themselves safe and help police be effective and pursuing criminals. However, people continued to seek out confrontation and conflict throughout the day. 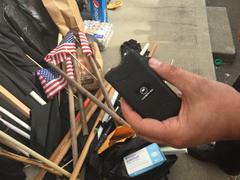 To further help our investigation, Berkeley Police ask any members of the public to send us photos or videos using any web-enabled device by visiting http://bit.ly/berkvideo. Thank you for your partnership in helping safeguard our community.